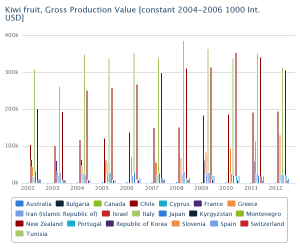 Kiwifruit cultivation is usually considered difficult to establish, as kiwi have a shallow, fibrous root system, and their pollination is not easy to obtain. In order to have maximum success, the soil should be well worked, with a very fine tilth, and should be fumigated before planting to reduce the incidence of kiwi pests and diseases. It is also important to have a fairly level ground for water management and correct partitioning of moisture: drainage must be good to prevent fungal infections, and strong winds are a problem because they damage the tender spring shoots. Vines should be set alternated to each other, with a spacing that was, before 1980, of around 5.5-6 meters apart, in rows 4.5m apart. In the 80s the new guidelines suggested a spacing of 2.5m of inter-plant spacing. Vines are usually trained on strong horizontal trellises with “T” shaped supports about 2 meters high, holding 3 wires 60cm apart. A better alternative are A-frame pergolas, that purportedly produce a yield 3 times higher than the traditional flat trellis. Plants must be staked until they can reach the wire, and must be directed to avoid forming tangled branches. There should be a single leader with fruiting arms every 50 to 70 cm, and they should be pruned in summer to suppress shoots (since these will not produce fruit until the following year). Try to train the prunes to fruit above the foliage, since shoots need a lot of sun for vigorous development, especially in areas that are not very sunny (e.g. New Zealand). Bear in mind male plants will yield the optimal amount of pollen when new shoots are left with 6 to 7 buds. The amount of nitrogen needed for mature plants is around 150 kilograms per hectare, and vines are usually fertilized twice every year (spring and early summer) with a total of 500 lbs (225 kg) nitrogen, 220 lbs (100 kg) P2O5, 121 lbs (55 kg) K2O, per hectare (which is equivalent to 202 lbs (92 kg) nitrogen, 89 lbs (4.5 kg) P2O5, 49 lbs (22.2 kg) K2O per acre). Each acre costs about two years of time and 3500$ to bring into production, as the plants need tending in the first two years due to their variable growth patterns. Kiwis are fairly resistant to wet seasons, so in California they usually drip irrigate and use overhead sprinklers for heat protection during hot summers: a mature orchard will need around 1000mm of water in the 8-month-long growing season, distributed about 50% in summer and 50% in the rest of the months. 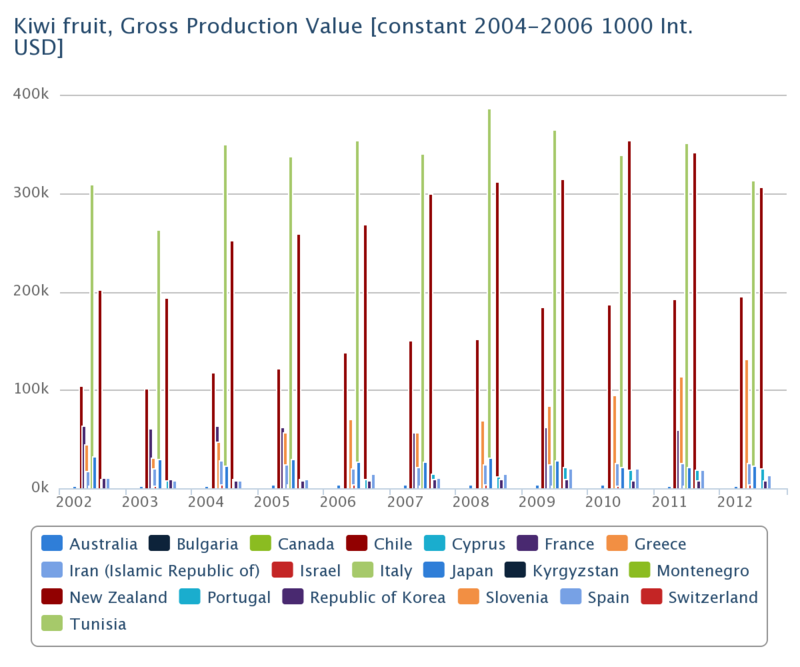 As of 2015, the largest producers are, in order, Italy, New Zealand and Chile.